I’m a big fan of chicken, chorizo and gumbo, so I couldn’t resist trying Kroger’s “Wholesome @ Home Meals in Minutes” store brand Cajun Style White Meat Chicken and Chorizo Gumbo when I recently ran across a package on clearance for $3.99 — approximately half-off — in the refrigerator case of a store’s deli section. The results were pleasantly surprising. 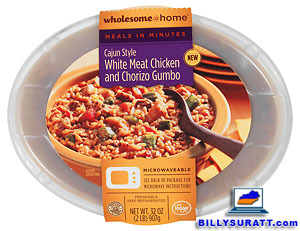 Wholesome @ Home Meals in Minutes Cajun Style White Meat Chicken and Chorizo Gumbo comes in a 32-ounce microwavable tub hermetically sealed with plastic wrap, covered with a snap-on plastic lid and then placed inside an outer sleeve of printed cardboard. Both the tub and the lid are recyclable polyethylene terephthalate (PETE 1). The preparation instructions are simple: remove the lid, cut a slit in the plastic wrap and microwave for approximately eight minutes. I ended up needing only about half that time, but heating times always vary among different microwave. One tub yields four 1-cup servings; it’s enough to feed two people realistically, especially if paired with an entrée or some side dishes, but I had no trouble eating the whole thing as a meal unto itself. I would have probably gotten two meals out of it had I not been particularly hungry at the time, and the convenient snap-on lid means you can easily store leftovers in the refrigerator with nothing left to clean up later. When you first open the package, the gumbo doesn’t look extremely appetizing. Let’s be honest, though — how many cold pre-packaged prepared foods do look appetizing? Don’t let the initial “chunky baby food” appearance turn you off, especially since it looks at least slightly better than many other soup or stew products before they’re heated (the disgusting-looking but tasty Dinty Moore beef stew comes to mind). The gumbo is well-spiced and packs a slight amount of heat, but not enough to be overpowering; you’ll probably want to pair it with a cold beverage, but you won’t fall over dead if you feel like digging in with nothing to drink available. Considering many so-called “cajun” foods packaged for mass market distribution are bland, Kroger strikes a nice balance here. 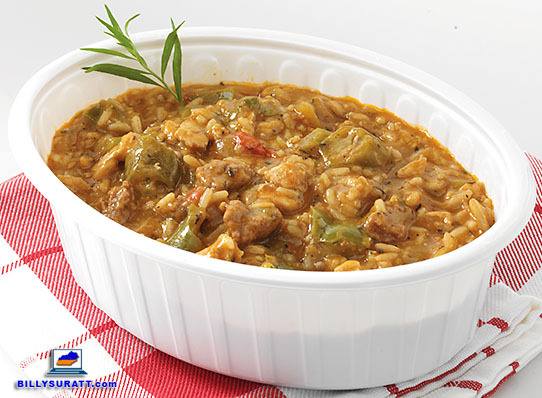 The gumbo incorporates sizable chunks of red and green bell peppers, as well as onions, celery, diced tomatoes and okra. The gumbo also contains sassafras leaf powder, another nice surprise. Okra and sassafras are both staples of traditional cajun gumbos, but many commercial gumbo recipes omit these ingredients. Kudos to Kroger for sticking with tradition on this offering. Large chunks of lean white meat chicken are present throughout. As one would expect given the product’s semi-premium price tag, the chicken is very lean; I didn’t detect any chunks of fat or gristle, which is more than I can say for most prepared meals containing bits of chicken. Crumbles of chorizo sausage are evident and contribute a bit of texture to the gumbo, but I wasn’t able to actually taste the chorizo. If the package didn’t say “chorizo” and the ingredients didn’t say “chorizo,” I wouldn’t have known it contained chorizo. That was a little disappointing to me since I love chorizo, but the sausage still no doubt contributes to the gumbo’s nicely-balanced overall flavor profile. This gumbo also contains an ample amount of enriched, parboiled long-grain rice, but not so much you’re left with the sense you just bought a two-pound tub of rice with a little bit of gumbo sprinkled on top. In fact, I wouldn’t hesitate to serve this with additional rice — ordinary brown rice, brown jasmine rice or brown basmati rice should all pair well. Perhaps best of all, Kroger avoids using any of the garbage often used in similar food offerings: no partially-hydrogenated oils, high fructose corn syrup or even monosodium glutamate, opting instead for plain canola oil, sugar and traditional cajun seasonings such as garlic, cayenne pepper and paprika. This was also a pleasant surprise and played a part in my decision to write this review since I won’t buy anything containing hydrogenated oils or HFCS. Nutritionally, one 1-cup serving contains 260 calories, 11 grams of fat (4 grams saturated fat), 45 milligrams of cholesterol, 780 milligrams of sodium, 26 grams of carbohydrates (2 grams fiber, 3 grams sugar) and 14 grams of protein. The saturated fat content is a little high, but still only represents 20 percent of the USDA’s recommended daily intake per serving; eat the whole thing and you can still easily come in under the daily allowance for saturated fats. High sodium content is the biggest nutritional problem evident here, but that’s rarely a deal-breaker for me since it’s common for prepared foods to be high in sodium and I don’t eat them day in and day out. If you’re on a low-sodium diet or attempting to limit your sodium intake, however, you may want to skip this gumbo (or at least limit your portion sizes). Kroger Wholesome @ Home Meals in Minutes Cajun Style White Meat Chicken and Chorizo Gumbo might not exactly transport you to New Orleans if you close your eyes and take a bite, but it’s tasty, filling, reasonably-priced (especially if you find it on sale) and won’t kill you since it’s made with wholesome ingredients — as it should be, given the name. That makes it a winner in my book. Chicken stock (water, chicken base [chicken meat, natural chicken juices, salt, sugar, autolyzed yeast extract, maltodextrin, natural flavor, onion powder, spice extract, turmeric (for color)]), enriched parboiled rice (long grain milled rice, ferric orthophosphate, niacin, thiamin mononitrate, folic acid), white meat chicken (cooked white meat chicken, water, canola oil, salt), vegetables (onions, celery, okra, green and red bell peppers), diced tomatoes in juice (tomatoes, tomato juice, citric acid, calcium chloride), cooked chorizo sausage (pork, water, spices, paprika, salt, tomato paste [tomato paste, salt, citric acid], sugar, flavorings, garlic powder, citric acid, turmeric), enriched flour (wheat flour, niacin, reduced iron, thiamine mononitrate, riboflavin, folic acid), butter (cream, salt), tomato paste, garlic, canola oil, cultured dextrose on maltodextrin, green onion, cajun seasoning (spices, salt, cayenne pepper, paprika), modified corn starch, sassafras leaf powder, parsley, citric acid. I review Campbell's Slow Kettle Style Soups Kickin' Crab & Sweet Corn Chowder ready-to-serve soup (15.5 oz tub). Who doesn't love chicken and dumplings? Here's a recipe for surprisingly edible faux chicken and dumplings using shelf-stable ingredients.